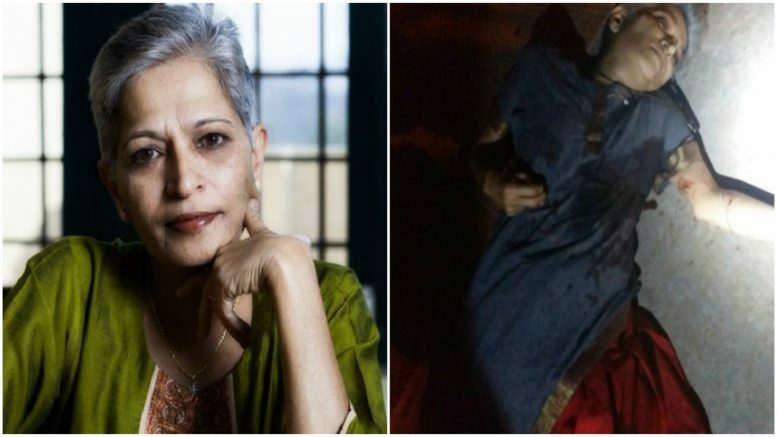 BENGALURU: A day after unidentified assailants gunned down journalist-activist Gauri Lankesh outside her house in Rajarajeshwari Nagar, Bengaluru police on Wednesday said they had not made any major breakthrough in the murder. 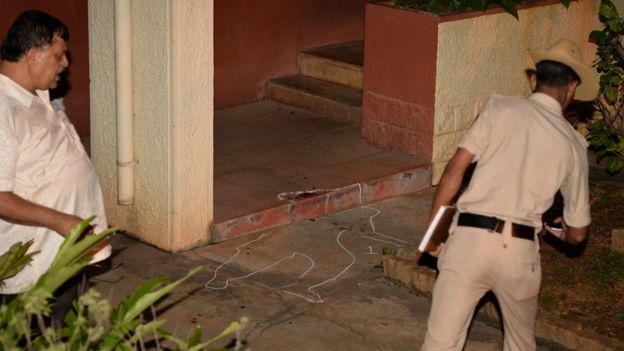 Chief minister Siddaramaiah said a special investigation team (SIT) would constituted to probe the murder, which he described as an “organised crime”. Contrary to their earlier claims that three men attacked her, police said there was no clarity on the number of people involved. They said the only confirmation they had was that one of the assailants shot at Gauri. Police commissioner T Suneel Kumar said they had retrieved footage from two CCTV cameras outside Gauri’s house. “The footage is not very clear. But it shows a man wearing a black helmet following Gauri after she gets down from her car and entering the compound and opening fire at her. We collecting footage from all CCTV cameras along the stretch between Basavanagudi, from where Gauri left, and Rajarajeshwari Nagar, before she shot dead,” he said. Gauri had got two CCTV cameras installed outside her house just 15 days ago. A senior police officer said, in the CCTV footage, Gauri first seen stopping the car in front of the big gate of her house. She sat for a few minutes in the seat and browsed through her mobile phone. “Keeping the car engine and headlights on with music playing, Gauri got down and enter the compound using the small gate next to the big one. Then she walked to the big gate and opened the latch. The assailant appeared at this moment, entered the small gate and fired at her. A bullet entered Gauri’s rib and she tried to run. The assailant ran behind her and shot at least four more rounds at her and fled,” the officer said. “From what we gather, soon after bullets were fired, a single headlight beam was turned on and its light fell on Gauri’s car. The next second, the vehicle took a turn and sped away. Its reflection on the car reveals it was a two-wheeler. Based on these facts, we suspect the assailant used a two-wheeler as his getaway vehicle. The assailant is a man of medium height,” the sources added. 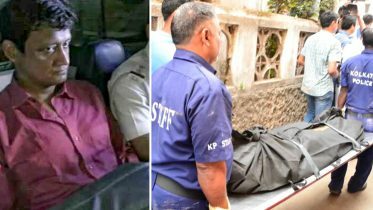 Quoting from the postmortem report, Indrajit Lankesh, younger brother of Gauri, said there were three bullets in Gauri’s body. “Two were found in the lungs, while the third one in the heart. The one which hit the heart proved fatal,” he said. Inspector-general B K Singh will head the SIT and Bengaluru DCP (West) M N Anucheth, who will also be the lead investigator, will assist him. As many as 19 other officers will be part of the team. “I’ve told them to take as many officers as possible and exclusively probe Gauri’s murder. It appears to be an organised crime,” Siddaramaiah said. He declined to comment on the possible motive behind the killing or the groups involved. “We condemn the killing. Only cowards can indulge in such acts,” he said. “I am confident the assailants will be nabbed. I am also open to a CBI probe. If the family members are particular about it, we will hand over the probe to the CBI.” Sources in the CMO said a section of the police top brass suggested handing over the probe to the state CID but it was shot down by the CM. “The CID has not made any headway in the probe into the Kalburgi murder case in the past two years. In this situation, it is not correct to direct the CID to probe Gauri’s killing,” said a source quoting the chief minister. Be the first to comment on "Man in helmet shot Gauri Lankesh, Karnataka CM forms SIT"